She was so covered in dirt, soot and grime, that when she was brought into the Wild Bird Fun we couldn’t even identify her species. The little bird had been caught in a glue trap, and while she had been lucky enough to escape from it before succumbing to thirst or starvation, she now carried a layer of sticky goo that attracted every bit of dirt and garbage found on the streets of New York. Because her feathers were covered in glue, she was no longer waterproof, and her sensitive skin was exposed to the rain and the elements. It wouldn’t have been long before she died from exposure and hypothermia. That is why we are so grateful to the kind people at the Colbert Report, who rescued her and brought her into the Wild Bird Fund. She was given gentle Dawn baths that got rid of the soot and glue, and revealed that she was, in fact, a Hermit Thrush. 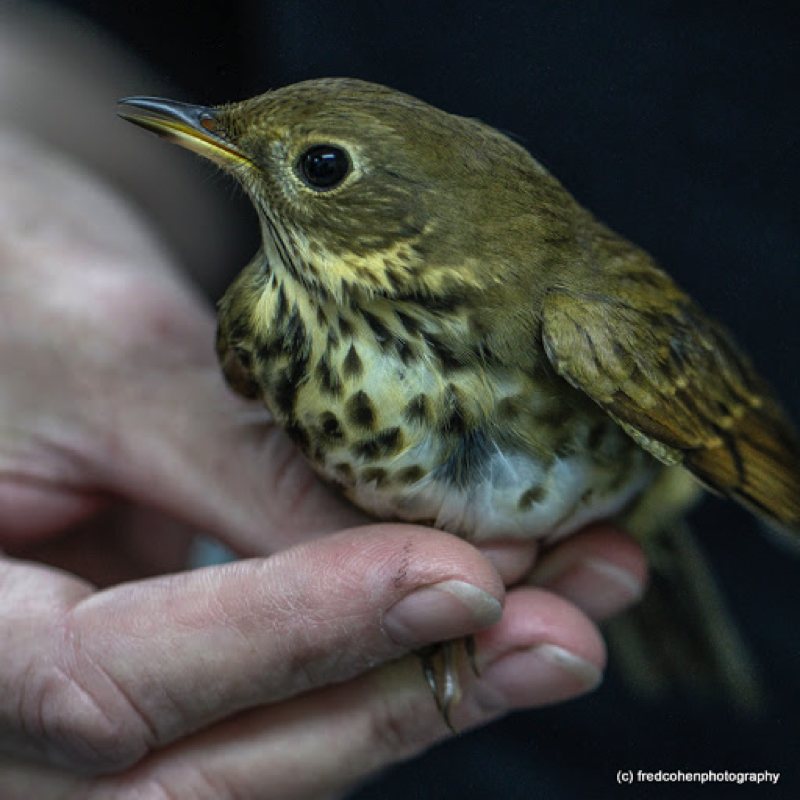 The Hermit Thrush (Catharus guttatus) is a summer migrant to New York who is more often heard than seen, thanks to their distinctive, mournful song (listen here) and their preference for nesting and foraging on the ground. After months of Dawn baths, and waiting for feathers too badly soiled to grow back in, we were able to successfully release our mystery Hermit Thrush back into the wild. She is once again rid of the dirt of New York City, and is able to enjoy the simple pleasures of digging through leaves, hunting insects, and flying free.